Aside from the keen gardeners amongst us, most people would say their ideal garden would look great with little input from themselves. Whether you’re a first-time homeowner with little experience or knowledge of gardening, or a busy professional with no time for gardening, a low maintenance garden could be the right option for you. If you suffer with mobility issues due to disability or old age, there are some great resources from the RHS outlining charities, tools and equipment that can help. But opting for a low maintenance garden can cut down on the worry and potential injury of struggling to maintain a demanding outdoor space. Whatever your reasons for wanting an easy option for your outdoor space, here’s our guide to low maintenance garden design, covering possible surface and layout options and the ideal plants. Traditionally when you think of a garden, you probably picture a wide open, beautifully manicured, emerald green lawn. However, this dream can be tough to create and maintain, as lawns demand a lot of attention to stay healthy all year round. If you’re lucky enough to have a very large garden, an area of unkempt lawn can be a great draw for wildlife like bees, but might not be the best to look at. 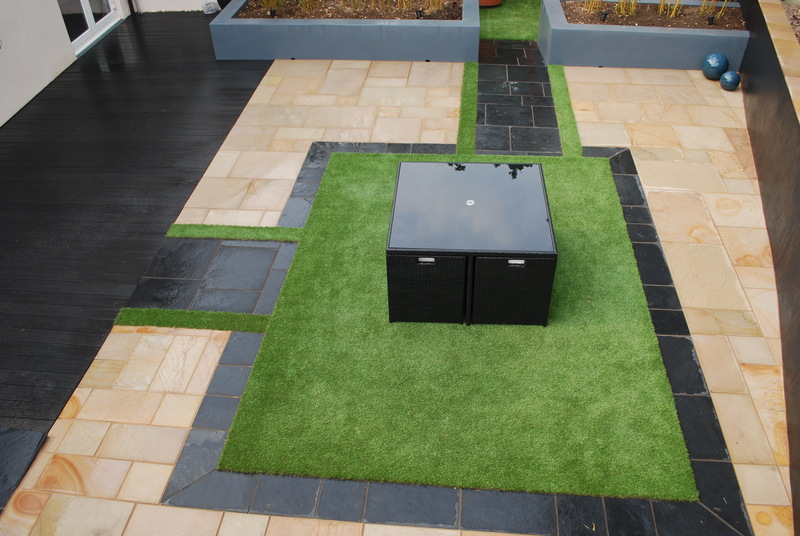 If you don’t fancy hours of scarifying, mowing and edging, why not go for something more contemporary – a stunning patio or a functional and non-slip composite decked area. These can be great choices if you have patio or bi-fold doors out onto the garden, to extend your floor space from the inside out, and are great for entertaining in the summer months. Alternatively, why not consider an artificial lawn? Once a bit of a ‘taboo’ amongst gardeners, artificial lawns are much more realistic to look at and touch, are easier to maintain than the real thing, and can be a great investment. A common misconception is that keeping plants in containers will be easier to manage than planting into the ground. However, in containers you have to worry about drainage, moisture levels and nutrients, which, when planting directly into the ground, nature usually keeps on top of. Rather than buying bedding plants and seasonal flowers that will be pretty for a while but then need replacing, choose some hardy shrubs that will grow and flower without much intervention – just an annual prune if necessary. Various species of Japonica (Japanese Laurel) or Hebe can be great choices for evergreen coverage, will be happy in most soil types, and are good for shady spots. Viburnum are also a great choice of shrub if you’d like some spring-time flowers – plant these close to areas such as paths or patios to make the most of the lovely fragrance. When it comes to planting, use a good quality black membrane to cover the soil that will keep weeds at bay, reducing the amount of work you have to put in further down the line. It looks great when covered in a layer of bark chippings or mulch. Here at Jacksons Landscape Design, we’ll carefully survey your garden space to best recommend the design and layout of your new low maintenance garden. Don’t worry if you’re a novice – we can provide you with a maintenance schedule and follow up advisory visits to keep it looking its best. As highly qualified and experienced garden designers, we’re waiting to help you design the right garden for you and your lifestyle – contact us, today!